Ginger | Become Healthy or Extinct! Ginger has been used for its health benefits for over 5000 years and is a favorite medicinal as well as culinary herb. The part that has the most medicinal value grows under ground. Often mistakenly called “ginger root” this is actually the rhizome of the plant, which is more of a subterranean stem than a root. Although you can use dried ginger and powdered ginger for health benefits, fresh ginger has the highest potency and benefit. Ginger has anti-viral, anti-bacterial, anti-fungal, anti-toxic, anti-inflammatory and anti-histamine properties. It has several medicinal properties as well. Due to its anti-inflammatory properties, ginger is used to treat rheumatoid arthritis, osteoarthritis, and various other muscular disorders. The chemical components of the root are instrumental in inhibiting the biosynthesis of prostaglandins, which are responsible for causing inflammation. It also helps relax muscles around the blood vessels and helps prevent blood clots from forming. Ginger contains special enzymes responsible for catalyzing the proteins in food, thus aiding in digestion and preventing cramps. Ginger also helps eliminate intestinal gas and relaxes and soothes the intestinal tract, while boosting the immune system. It protects against atherosclerosis by lowering cholesterol levels and preventing the oxidation of low-density lipoprotein (LDL). Ginger has been proven to successfully treat nausea, particularly in the form of seasickness, morning sickness, motion sickness and as a side effect of chemotherapy. It cures morning sickness in pregnant women. Ginger is also used for reducing toothache and the discomfort, which arises due to the infection in the upper respiratory tract due to its antibacterial and antifungal nature. Chewing on fresh ginger helps freshen the breath. Being a warming herb, ginger makes a natural decongestant as well as an antihistamine, making it the perfect remedy for fevers, colds and allergies. This property also makes it effective in stimulating circulation of the blood. It helps stimulatSe the secretion of mucus, quieting your cough and soothing any scratchiness in your throat. It helps soothe chest pain and bronchitis a well. Ginger contains Vitamin C, zinc and magnesium. It also improves blood flow to the sexual organs. Some studies show that it can even help inhibit the replication of the herpes simplex virus. 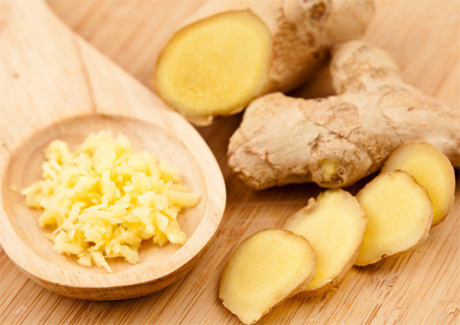 As a mood enhancer, ginger’s cineole content helps contribute to stress relief. Ginger is a strong herb, so please take adequate care when having high amounts of it. If you are suffering from ulcers or some other very serious gastric problem do not take high quantities. During a pregnancy be extra careful if you have any such gastric problems. How much and how to take it? Take up to 3000mg per day. Fresh grated ginger is the best, but powder will work in your recipes. You can also grate 1 teaspoon ginger and make 3 cups of tea and have it through the day. 1. Gas, nausea, vomiting and loss of appetite – Take ¼ tea spoon of ginger powder after breakfast and dinner with water. 2. Constipation – Take ¼ teaspoon of ginger powdered with warm milk. 3. Cold, cough and bronchitis – Take 1 tablespoon of ginger powder and 3 table spoon of honey, mix them well, take ½ tea spoon of ginger and honey compound after breakfast and dinner. 4. Fever – 1 table spoon of ginger powdered and ¼ teaspoon of black pepper. Mix them well and take ¼ of this powder 3 times a day with warm water. 5. Migraine – ½ table spoon of ginger powder and 2 table spoon of Fennel seed powdered, mix them and take 1 tea spoon 3 times a day with water. 6. Toothache – Chew small piece of fresh ginger. Nice article. Thanks for sharing with us that usefull information about ginger benefits. Actualty ginger has many benefits for people and lemon also. What about 1/4 tsp ground ginger straight into hot water and stirred in? Is that safe? If so, how much can one have in a day? I think it would be stronger than the tea, since you’d be drinking the actual powder. Dear Paige, use that much powder that feels stimulating enough to the throat, but not harsh on it. So depending on your body type, it may also turn out to be a bit lesser than 1/4 tsp or more than 1/4 tsp. Pitta body type is most sensitive to Ginger.